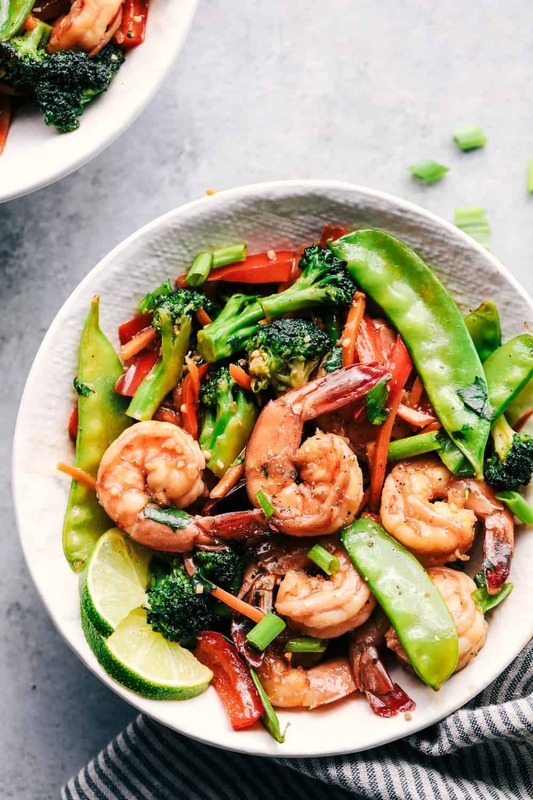 This Garlic Shrimp Stir Fry is one of the easiest meals that is packed with so many delicious veggies and shrimp. Glazed in the most amazing garlic sauce, this will become an instant favorite! Phew! It has been a busy last couple of weeks and it feels so good to be back to blogging. I took a week off to go on a trip with the hubby just the two of us to the Eastern Carribean and it was AWESOME! It is amazing what a week off of sun and relaxation can do for one’s soul. Highlights of the trip included bobsledding in the Jamaican jungle, swimming with the stingrays, and taking a lot of naps on the beach. It was such a great time. It is always busy catching up from missing a week and coming back from a trip makes you want to get back on the healthy eating bandwagon. Sometimes I feel like we get in a rut of chicken and veggies so it so nice to have a delicious and healthy meal that has such amazing flavor like this one. 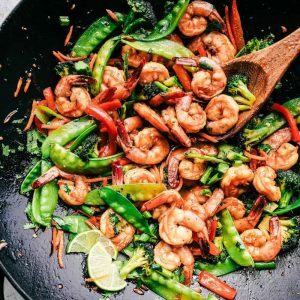 How do you make Shrimp Stir Fry? This meal is so easy to make and is ready in under 30 minutes. You start by mixing the soy sauce, sesame oil, brown sugar, and garlic. 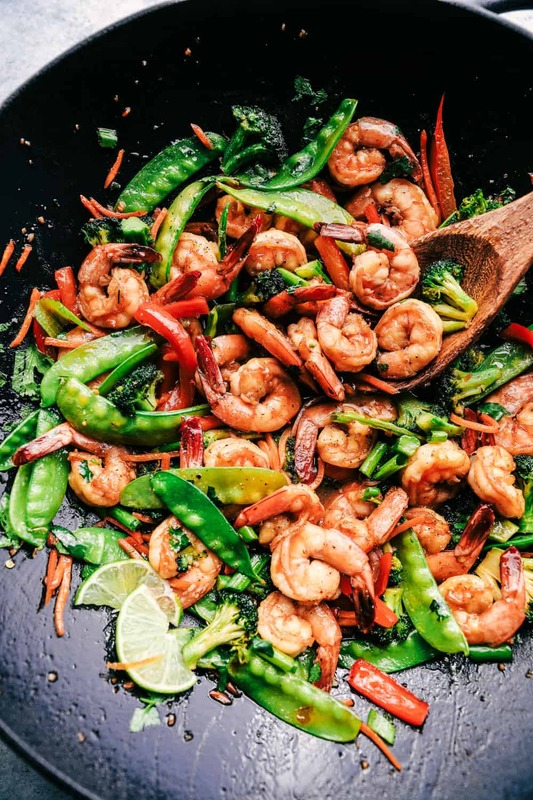 Add the shrimp and peppers to a wok or medium sized skillet and pour the sauce on top. Cook for 1-2 minutes and then add the broccoli and sugar snap peas with the chicken broth-cornstarch mixture. Cover and let cook and thicken 2-3 minutes or until the veggies are tender. Do I need to leave the tails on the shrimp? Nope! Some actually prefer to eat the tails, but you can cook the shrimp to your families preference with or without the tails. This was easily one of the best healthy meals that I have had. You guys will LOVE the garlic sauce on top of the veggies and shrimp. This was so flavorful and so good for you! I know that this is one that you will make again and again for your family! In a small bowl whisk together the soy sauce, garlic, brown sugar, and sesame oil. 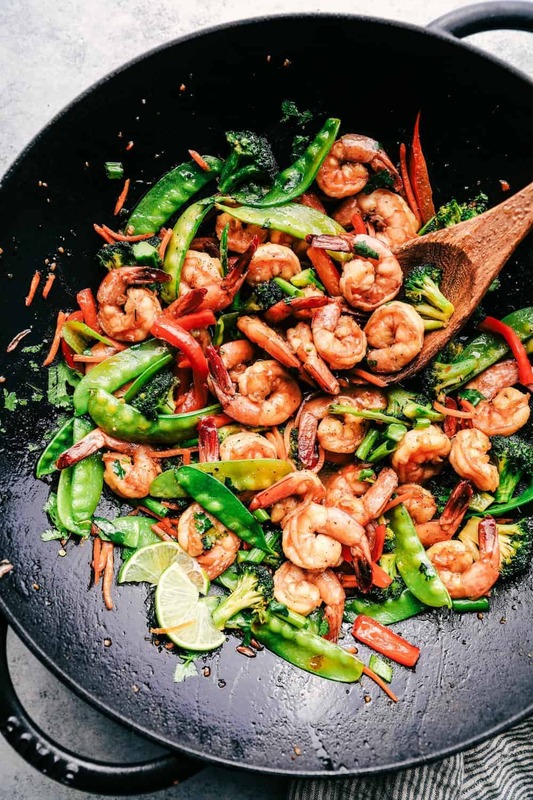 In a medium-sized skillet over medium-high heat add the shrimp, peppers, and carrots and pour the sauce on top. Cook for about 2-3 minutes or until shrimp is pink. Whisk the chicken broth and cornstarch in a small bowl and add it to the skillet with the broccoli and sugar snap peas. Stir until incorporated and then cover and cook 3-5 minutes or until broccoli is tender and the sauce has thickened. Serve with chopped green onions and serve over rice if desired. Thank you for the garlic shrimp recipte. I finally got it. Haven’t tried it yet but sounds so good. A very delicious-looking meal. I hope it freezes well, because I tend to make things in big batches! That looks so good. It’s been a while since we’ve had stir -fry. Thanks for sharing. Followed the recipe but it’s like a soup. Cooked longer than recipe calls for sauce to thicken but it did not. Everything’s soggy. These shrimps look so bright, fresh and delicious! I love the colors that the fresh vegetables bring to the dishes! I am planning to make these for Saturday night but don’t know what sugar snap peas are. Can I use the regular peas in the recipe? It wouldn’t taste much different I think. I’m looking at the picture and it looks like there are Snow Peas in the recipe, not sugar snap peas. But they are both readily available. Snow peas are flat, while sugar snaps are round because of the “peas” inside. 15 minutes ? I’m in ! Wow! This recipe is truly a delight, Alyssa! I tried to stay as religiously close to the recipe as I can. Although I did substitute green bell peppers and white sugar instead of the red bell peppers and brown sugar listed here. I also opted to use coconut soy sauce and thank goodness the outcome was loved by my family! Kudos! Tasty but very soupy and not really a stir fry preparation. I love this recipe. I’ve cooked it a few times with shrimp and other times with chicken. I like to add bean sprouts at the end to give it an extra bit of crunch. I do think the recipe needs a bit more corn starch than stated as it can be a bit watery but it all depends on how soft you want your veggies as they’ll produce more water the longer you steam them under the lid to soften. Hi there! I see what looks like lime in the photo’s, but not in the ingredients? Do you add lime? Amazing recipe! I went exactly by-the-book, but as other comments are saying, the sauce doesn’t thicken and it’s rather soupy (while AMAZING in flavor). What would you recommend to thicken up the sauce? I’ve made this twice and will continue doing so…just wish the sauce was a bit thicker. Adding flour, or more cornstarch? Less chicken broth? Really looking forward to some suggestions. Thanks!! Love this recipe! I am a pretty pro cook. I knew right away there was not enough corn starch to thicken the sauce. You can add 1tsp additional starch to a 1/3 cup broth and whisk. As the sauce is bubbling add just enough additional prepared thickener until it reaches the desired thickness. Discard the rest of additional thickener. The end product was a bit soupy like – too much liquid. I had to add more cornstarch to even it out. All in all, a great option that’s quick to make! Just made this recipe today! It was delicious and easy to make . After reading the reviews first ,I decided to add more cornstarch since a couple of people commented on it being soupy. It came out great with the extra corn starch . I also decided to add mushrooms and chicken , the outcome was amazing. Make a cornstarch slurry 2 parts cold water and 1 part cornstarch if you need to thicken the sauce. Do it before you overcook the vegetables. this is way too sweet, and the sauces doesn’t thicken. 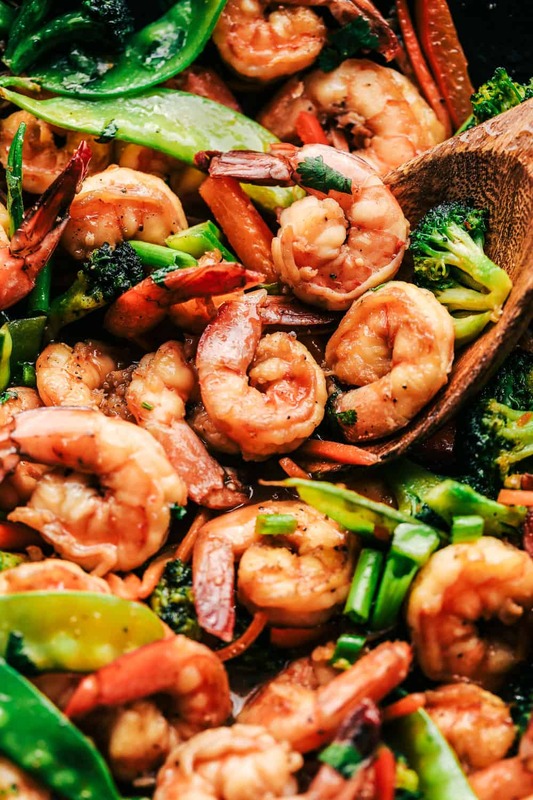 I’d recommend adding the shrimp and all the veggies at the same time to avoid overcooking the shrimp. The recipe should call for a Tablespoon of cornstarch this will fix thickening problem. I made a few changes that really improved this recipe. Increase the corn starch to 1tbsp, replace brown sugar with honey, and add 2 tbsp of oyster sauce. I also seared the shrimp in butter first, then removed it and put it back in at the end so it doesn’t get tough and over cooked. I added mushrooms and water chestnuts. Great recipe. Thank you! I made this last night and I really liked it. Picked it because I was craving shrimp and had most of the ingredients already. Always nice to find recipes where I don’t have to buy tons to make it. Plus doesn’t require any fancy kitchen tools. Very tasty recipe. Veggies-wise, I adapted to what I already had in the kitchen and used carrots, leeks, spring onions and mushrooms. It worked great! And I was rushing, so didn’t have time do the broth part, just the sauce, and it was deelish! Some feedback for you: the links at the bottom to the “products I love” are all broken. Also, it seems as though when I try to rate the recipe, the only choice is 5 stars! I wanted to give it a 4. Thre’s no way to click on less stars, and once you click on the 5 stars, there’s no way to cancel it. Very tasty and easy to make but definitely need to play around with corn starch to broth ratio. It was too runny. This stir fry is AH-MAZING!! I cooked it for my family last night and they loved it! I’m glad I read the reviews first and used a tablespoon of corn starch rather then a teaspoon. For that reason I’m giving the recipe as written 4 starts instead of 5. However, making the corn starch substitution, the recipe turned out perfect!! I’ll be making this dish time and time again. Plan on switching it up with other protein like chicken and beef. Again, great recipe!! I’m a teen and I just tried this and it was amazing! It has all the flavours even if you have to substitute things like i did! This is seriously tasty! BUT…as others have said, the broth to corn starch ratio is way off. I even upped the corn starch to 1 tbsp as suggested, but still found it soupy. I’ll make it again for sure, although I’ll provably do 1/4 cup broth with 1 tbsp corn starch.